Sixteen year old Kyoko Mogami does everything for her childhood friend and crush Sho Fuwa. She left her hometown in Kyoto to follow Sho to Tokyo where he could live out his dream of being a famous pop star, and now she works two jobs to pay for the apartment she and Sho share. But one day, Kyoko overhears Sho confess to his manager that he only keeps Kyoko around to act as his maid. Brokenhearted and betrayed, Kyoko vows revenge on Sho, claiming she'll overtake him in show business by becoming more famous than him. 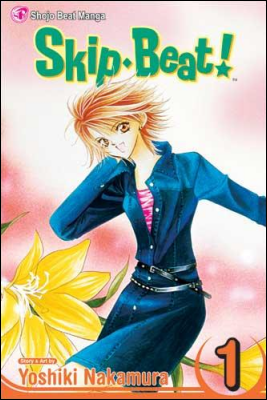 Thus begins the story of Skip Beat!, a romantic comedy manga (Japanese comic book) written by Yoshiki Nakamura. Infused with her desire for revenge, Kyoko attempts to join L.M.E., the rival of the talent agency Sho works for. But Kyoko soon discovers it takes more than just force of will to become famous. It takes talent and a passion for the craft that makes or breaks one's career. While Kyoko begins her journey to stardom with neither of these things, her tenacity catches the eye of L.M.E. 's president, as well as the top male celebrity in Japan, Ren Tsuruga. The president has Kyoko join the "Love Me" section, an L.M.E. organization that will teach Kyoko what it means to love and be loved by the audience. If Kyoto completes her tasks well, she'll début as an actress. Skip Beat! is currently my favorite manga. I absolutely love it! One of the reasons why I love it is because it is not a typical romantic comedy. The story is very original with its characters, their relationships, and how conflicts are formed. The main love triangle is both wonderfully fresh and addictive at the same time. Skip Beat! can be a little hard to understand at times, as Kyoko has demonic representations that seem to transcend from Kyoko's imagination to the physical reality. It can therefore be difficult to understand if what you are reading is actually happening or is just one of Kyoko's fantasies. Kyoko is also very eccentric, and the manga exemplifies this by tenfold. 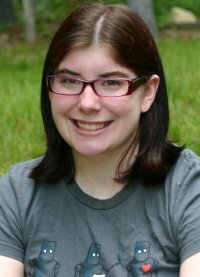 This can make her seem hysterical early on in the story. But Skip Beat! does an excellent job establishing a dynamic between the humor and drama of the story. This comic will make you laugh with absurdity, and yet still force you to care and worry about its characters at the same time. It may be a little weird, but it is definitely awesome enough to check it out. 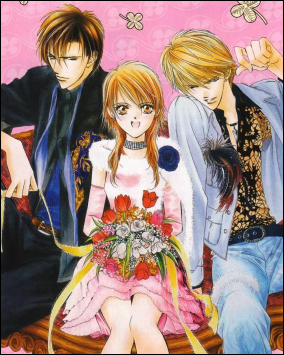 The Skip Beat! manga is still ongoing. Currently, 23 volumes have been released in Japan. The 20th volume was recently released in America on March 2, 2010, and the 21st volume is scheduled to be released on August 3, 2010. A 25 episode anime of Skip Beat! has been released in Japan, but there is no news on when it will be licensed and released to America. However, one can watch legally streamed episodes of Skip Beat! at Crunchyroll.com. I give Skip Beat! 4.5 out of 5 stars.